In a few quite moments while waiting for dinner to roast itself in the oven, I decided to crack open the spoon oil I made in last month's Grandma Club. Yes, Grandma Club is back and yes, spoon oil is exactly what you think it is. 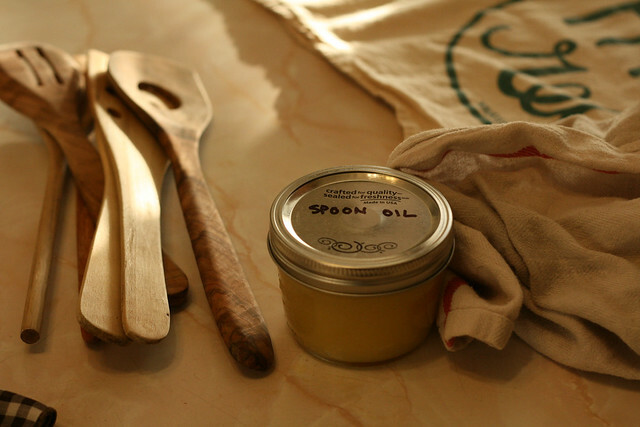 Part beeswax part mineral oil, this mixture is perfect for reviving your old wooden spoons, cutting boards, wooden bowls, and similar kitchen items. I must admit, my wooden utensils were in a sorry state. 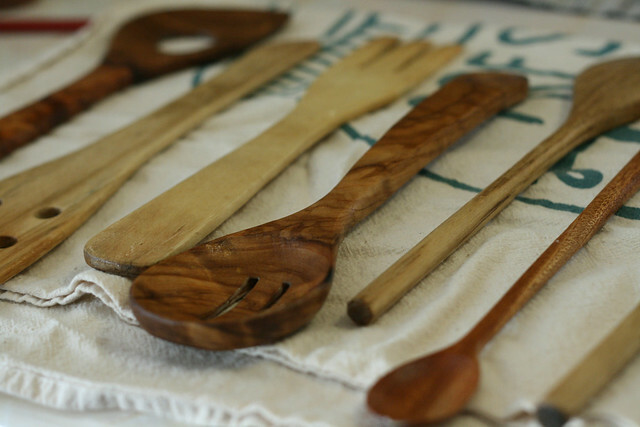 It was a nice ritual to condition my well-loved wooden spoons; an activity that made me just want to acquire more wooden utensils. I'm especially keen to get more olive wood items. 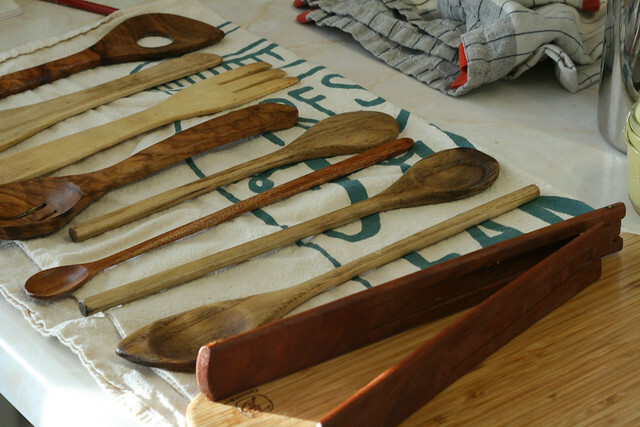 So be warned, conditioning your wood spoons may kick off an itch to buy more of the same! If you are interested in making your own, us Grannies use 3191 Miles Apart's recipe/directions. It was quite easy in steps, but requires some elbow grease. And a few drinks. Making tart cherry liquor has turned into an annual ritual. I was afraid that this year, because of the wedding, I was going to miss cherry season. I tried to tell myself it was no big deal; I don't get to make this every year. 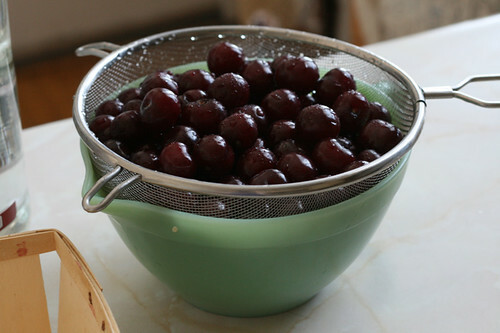 To my great amazement, I saw tart cherries at the farmer's market last Sunday and snatched-up 2lbs at a mere $5. As I skipped home to start the first stage of making this liquor, I realized the making of it is a big deal to me. 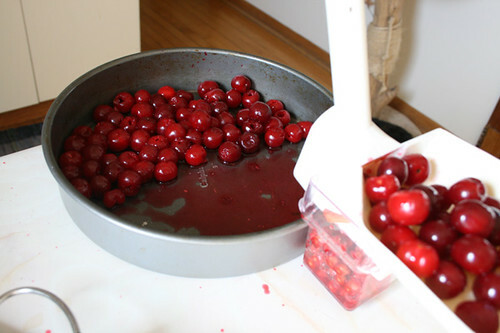 I have a semi-auto cherry pitter, which is tons of fun to use. The cherry juice splatters everywhere, making it mandatory to tie aprons in odd ways around my body. 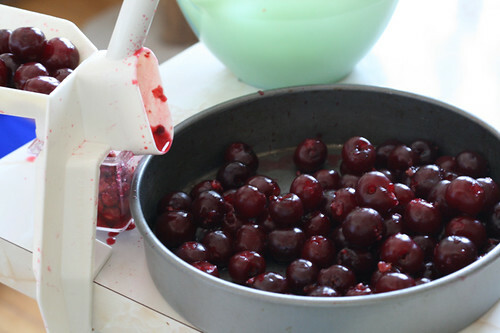 The "cha-chunk" noise of my pitter as a push the lever into a fresh cherry is very satisfying. Better yet is the plunking of these mangled globes into the liquor and the patient waiting as it changes into something you aren't quite sure how it will taste. Each year I have made this liquor, it has tasted completely different. These type of surprises are ones we rarely get now a days. 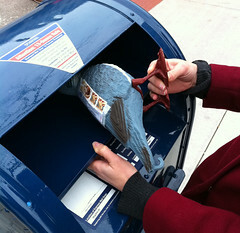 It reminds me a lot of when I was young and I would mail in a box-top with some money; I had no idea if I would ever get my snazzy decoder ring or my money was lost to the cereal prize gods. It takes about 4 to 5 months to make it, which falls perfectly with winter, right when you want a little reminder of summer. A romanticized version of summer, of course, in a small glass of cherry goodness. This time around I decided to make a double-batch so I have some of this liquid to give as presents this holiday season. Have you ever tasted cherry liquor? It is an acquired taste, but if you like dessert liquors or after-dinner drinks, I would give this drink a taste. 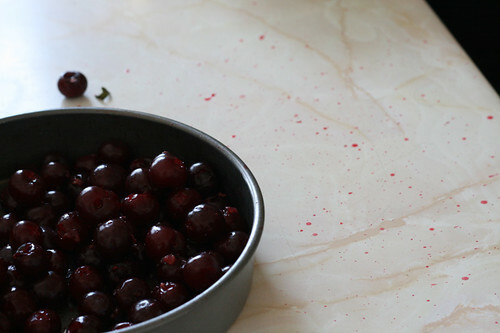 If you still have tart or sour cherries in season where you are and you try this recipe, let me know how it turns out for you. Due to the plethora of shawls I'm making as of late, I've been doing a lot more knitting lately, which has got me thinking about spinning my own yarn. I think it started with this "beginning spinning part 2" video from Sue Macniven, and snowballed from there. I've got a bit too many projects on my hands to start a new hobby, so for now, I will live vicariously through other spinners. 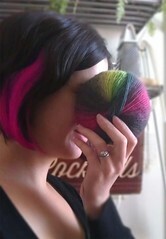 Here is a video from Megan about how to spin yarn on a drop spindle. She has oodles more tutorial videos on spinning on her site, so make sure to check them out. Vera Videnovich offers weekly spinning wheel rental (for only $10!) and spinning classes. I read elsewhere that she has a sheep share program, but could only find her produce share on the website. Please comment if you know of any other wool/roving/yarn shares or CSAs! In the post about my first sweater, I mentioned that I have been doing other things besides knitting in preparation for winter. These other actions are entirely centered around food. Donovan & I have been Farmer's Market buddies all summer and have been surprised at not only how much better the food we get tastes, but as how it is less expensive than buying the organic equivalent at the grocery store. I have taken this trip one step further to buy a whole bunch of what is in season at the time, while it is yummy and inexpensive, and then going home to freeze it. I use some of my haul to make a fresh item, like pie or a nice fruit salad, but the rest of it gets prepared and put in the freezer. Donovan & I both lucked out when buying bulk for preserving reasons; we were able to get 15 lbs of blueberries for $18 and 12 lbs of tomatoes for $10! You can have the same luck too, just ask when you go to the market! Most of the farmers at the markets have bulk purchase discounts, and if you are going to use the goods for canning, ask for "seconds." Seconds are veggies and fruits that are just as yummy as the ones they display, they just aren't so pretty, so they sell them at a discount. So far I have frozen sliced apples and blueberries, which I hope will bring a bit of summer into our dull Chicago winters. If you want to freeze in season goodies for later use, make sure to do a search on the best way to prepare them. Some produce requires you blanche (quick boil and then plunge into ice water) before freezing. To avoid that huge lump of frozen something or other, I found that freezing the items in a single layer on a baking sheet first and then placing them in a plastic bag, alleviates this predicament. You will have to cut and perhaps peel most produce too, but it is definitely worth it. I've been peeling and coring all of my apples by hand for both making applesauce and for freezing, but my friends recently bought me an apple peeler, which cuts this processing time significantly. 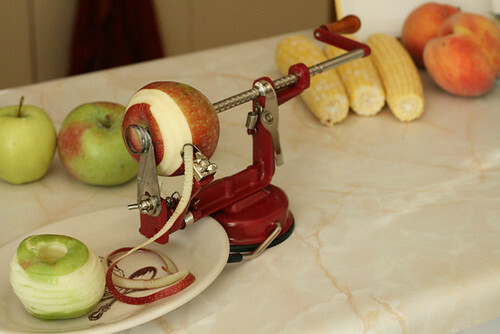 If you are big on making applesauce and pies, I definitely recommend investing in a crank-style apple peeler. I've also been gathering fruit at the markets to make jam. 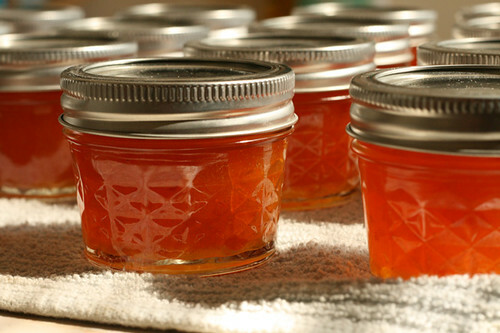 I was lucky that I did not miss apricot season with my traveling and made a nice batch of jam from that. I also experimented with blueberry jam from that huge box of berries I got. The color of those berries are intense and after all was said and done, my kitchen looked like I just murdered a muppet! As for the tomatoes, Donovan & I got together to can them in crushed form. This process was much easier than we expected; we wrote about it on the Grandma Club blog. If you are not ready to can but want to save a bit of summer for the upcoming winter, I suggest to freeze some produce. You don't need that much space in your freezer at all. After they are frozen on the baking sheet and placed in bags, you can arrange the bags like little books on a shelf in your freezer. I have quite a small freezer, but have just stacked up to make space for these treats that will get my house smelling like summer when snow is covering the ground. Happy preserving! Before I leave, I wanted to make my friend's recipe for Kahlua. 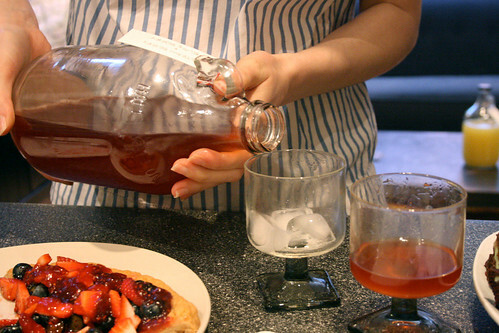 It takes 2 weeks of infusing, so by the time I get back from my trip, I will have some lovely homemade liquor to sip on. (It will make my homecoming even that much sweeter.) This recipe calls for chocolate syrup and instant coffee. I just used whatever water soluble coffee my corner market had, but Noel and Denise (who this recipe belongs to) used Via. 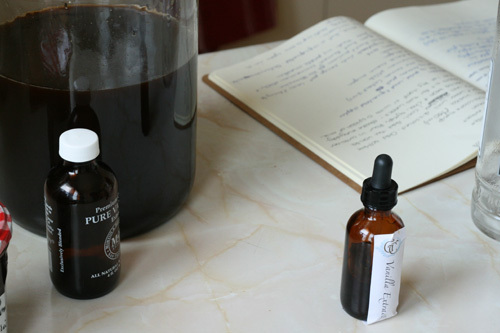 * I'm not one to keep chocolate syrup in the house and I didn't feel like running out and buying any just for this recipe, so I just made some instead. It was easier than I thought and made plenty; I used the recipe from Small Notebook. Boil sugar and water until dissolved. Add soluble coffee (I used a mix of Taster's Choice and Via), stir until dissolved, cool. Add the vanilla extract, vanilla bean and chocolate syrup. Pour in container, add vodka, and let flavors sit for two weeks. Shake everyday. Serve over ice by itself or with a splash of milk. Homemade liquor falls under Grandma Club status, though this is not a project the grannies did together. We have, however, been doing plenty! Check out our recent posts about touring the Chicago Honey Co-Op Apiary, going out to Bingo Night, and making Mozzarella Cheese. *OK, so, the recipe doesn't belong to Noel and Denise, but is rather the invention of Denise's grandpa, hence the recipe name. Denise's grandpa was a chemist who invented liquid soap and low fat dog food, so I would say you can trust his food chemistry! Vegetarians: I suggest skipping over this post. For those meat eaters, this is a great opportunity to see where you food comes from and support a local farm. The lovely Johanna of Whirly Bird sent me an email about a Chicken Dinner Workshop happening in Taylorsville, KY this month. 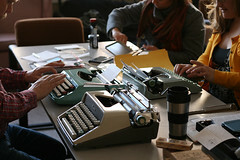 She went to the first workshop they ever did and wrote about her amazing experience here. Right after this post I immediately asked her if she new of any other farms doing this type of workshop, but my searching and her knowledge came up with zilch. Lucky for those of you in or near Kentucky, RiverSong Farm is doing this workshop again! Oh dear, if I wasn't out of town during this event, I may have just made the 5 hours drive to do this! The details are below. You can RSVP via their Facebook page, or if you are like me and don't have a FB account, I'm sure you can also call to RSVP. Description: Learn how to take a chicken from the field to your plate with another of our chicken dinner workshops. Get involved with your food. See how your chicken was raised, and the satisfying life it had before you eat it. The course is $10, and covers the cost of a live chicken. After we demonstrated how to process two chickens, each participant will pick out their own chicken and walk through the process with us on hand to help and talk you through it. When you leave, you'll have a bagged and chilled chicken ready for your fridge, and a recipe for cooking it. No longer will you need to eat sad unhealthy chicken from the grocery again. Last Sunday the grandmas went fruit picking in Homer Glen, IL, just an hour outside of Chicago. We've already made a little post about our adventure, should you be interested. It was one of the most expensive grandma clubs, but we had so much fun that we agree it was worth every penny. We also froze a lot of what we picked, so we now have fruit for a good while. 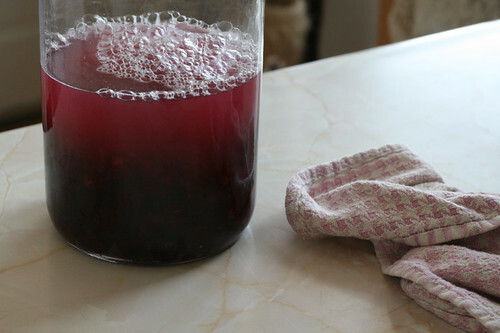 All of us made plenty with the fresh fruits we picked - one of the many things I made is a recipe that has been on my to-do list for years: cherry liquor. The only cherries they had ready to pick were sour cherries. At first, all the grannies were wondering how sour were the sour cherries and what we could use them in. All of those questions stopped once we sampled a cherry from the tree. It was so yummy on its own, we fell in love with them. When I got back from picking a few of hours later I was so happy to find that most cherry liquor recipes called for sour cherries. With that, my adventure in cherry splatter began. A couple of years ago I got a cherry stoner/pitter and was excited to actually put it to use. But, holy crap, pitting cherries is a messy messy job. I ended up putting on a apron and tying a dish towel around my neck in order to catch most of the splatters from the pump striking through the cherry to pop out the pit. It was a fun mess though. The original recipe I have had my eyes on for years used both the cherries and their leaves...I didn't pick leaves, so I was very sad at this discovery. (It required about 60 leaves, too many to just say, eh, screw it). 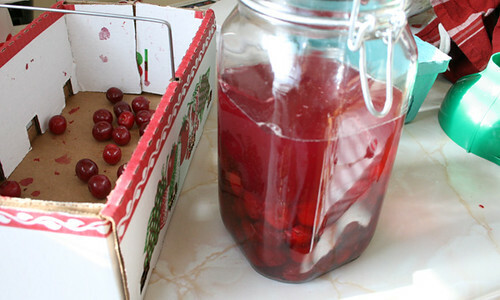 So after some searching and recipe comparing, I decided to use this recipe for tart-cherry liquor. The cherries need to settle for a few weeks, then after the sugar is added, it needs to settle for a few months. So, this seems it will be a winter liquor, which is fine by me. With how short cherry season is though, I strongly suggest to go forth to the farmer's markets or u-pick farms and gather enough to eat and make liquor with. 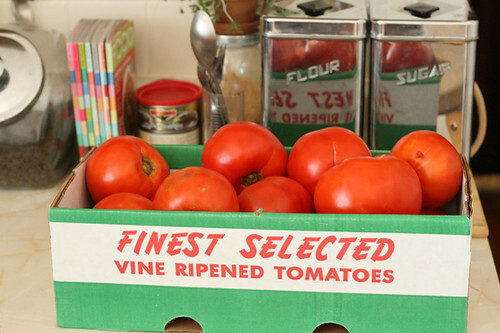 You can find a u-pick farm near you at this site, which separates the listing by state. I would definitely call the farm before you go to see if they are open this season and what is available to pick. With all that, I hope everyone has a lovely 4th of July and gets to eat some awesome pastries this weekend! I've been going through a bit of a crafting slump, but have found a lot of motivation in the kitchen. I've been baking, cooking or something-ing in the kitchen everyday. I've hit a few bad recipes, but have also enjoyed plenty of awesome ones too. 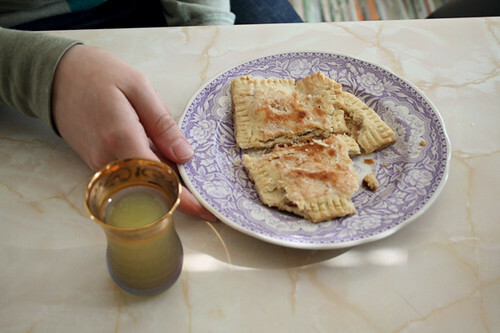 The photo above is a homemade toaster pastry/tart that Donovan and I made on Saturday. The recipe is from Jam It, Pickle It, Cure It, a book that has the seal of a approval from all three grannies. The recipe says it would make 10-12 tarts, but we were only able to roll out 8 from each batch. Good thing we made a double batch so we could split a good amount. * I filled mine with raspberry jam while Donovan filled hers with lemon curd she made herself (from the Alton Brown recipe). Even with the low quantity yielded from the recipe we have dubbed the pastries excellent and will surely be doing them again. I've been so busy in the kitchen that I totally forgot to mention that Donovan and I were interviewed for Pinball Publishing's CoinOp. Donovan and I love Pinball. We've been printing our stuff with them for years; they are always our go-to press. We actually just got our new business cards printed from them and absolutely love them. Double-sided, full bleed cards with trasnparency - so well done! Enough press geekery from me, I'll be posting some recipes that I've made and approved later this week. Have a lovely Monday. * While eating a toaster pastry for breakfast this morning I realized that the reason we got only 8 from the batch is because we made them largr than suggested. This makes for a filling tart, which is awesome, but unfortunately they are too long for my toaster. Oh, why did my toast-r-oven have fry out last year? Combine juice, ketchup and honey/syrup in a medium skillet. Bring to a boil and boil mixture for 2 to 3 minutes, until it gets syrupy. Remove skin from kielbasa (I didn't do this) and cut into 1/2" thick slices. Add sausage slices to sauce. Cook over high heat, turning the slices occasionally, until mixture reduces almost completely and coats the sausage slices (2 to 3 minutes). Serve as is with toothpicks or on top of Ritz crackers. This month's grandma club is a little different than usual. We are flavoring liquor on our own time and getting together tomorrow for a tasting as our "meeting." No, we aren't making the actual liquor in our bathtubs or anything, just buying 151 proof vodka and infusing it. I am making two different flavors: Strawberry/blackberry and minneola tangerine (a cross between a clementine and a grapefruit). 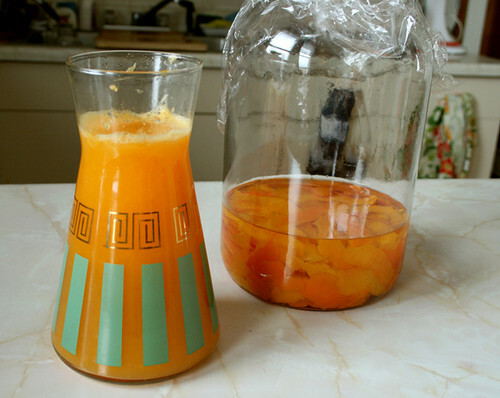 I only needed the rind from the tangerines, so I made juice from the rest of the fruit. It is really tasty. Tangy and sweet; a good change from orange juice in the mornings. Of course, we will be posting pictures and recipes next week after we tasted our products. I'm quite excited to see how all our liquors turned out. Congrats! Email me your shipping addresses and I'll send the book your way. I used Random.org to choose the winners; it is a fun app. I need to come up with more reasons to use the integer generator. P.S. - Bakerette has a lovely recipe for minneola cake!